The 2019 Hops Blend is Here! Time to get stoked! 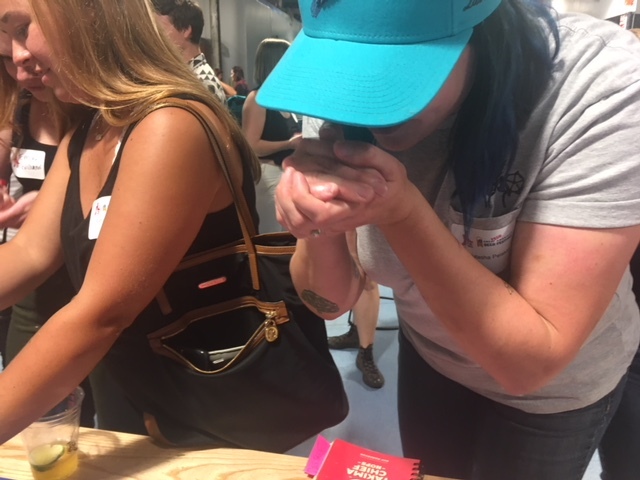 At the 2018 GABF fall members meeting hops rub everyone participated in creating the hops blend for the 2019 Pink Boots Collaboration Brew Day. Membership voted on their favorite; now the experts at Yakima Chief Hops are creating and packaging this exclusive blend. 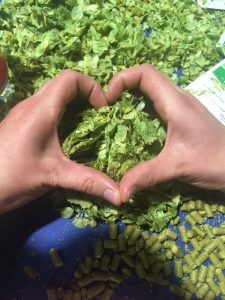 Just like last year, Yakima Chief Hops will donate $3 from every pound sold to Pink Boots Society. Don’t delay! Order your hops by December 3rd. Hooray for great partners! Aroma notes: Stone Fruit, Tropical, Dank, allowing you to go a lot of different directions with your style choice. 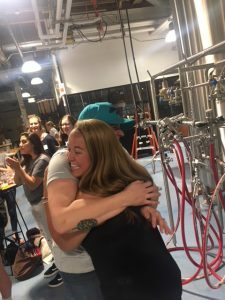 Want to participate in the 2019 Collaboration Brew Day? All the information you need can be found on the Pink Boots website. Read On to Learn How Natasha Created the Winning Blend! Pink Boots Society: Natasha, for those who weren’t at the hops rub, what transpired? Natasha Peiskar: In the beginning, everyone individually assessed the hop plugs provided by YCH. Each person in attendance had 5 coins with which to vote for the individual hops that they liked. I am not entirely sure, but we assessed at least 15 varietals. From there we were invited to start creating blends with the top 6 voted hop varietals: Glacier, Cashmere, Mosaic, Loral, Sabro and Simcoe. Those who participated in blending put forth their creation for final voting in which each member was given one coin to vote in the final blend. PB: You created the blend with the help of Barbara and Sam. Were you paired up, did you know each other? NP: Actually the pairing up just happened naturally. As everyone was going through the hops assessment, conversations broke out and fast friendships were formed. I’m definitely thankful for Barb and Sam’s feedback in order to create the final blend we put forth for voting. We started out with the individual hop plugs and I was looking for varieties with great stone fruit (apricot, peach), tropical (pineapple, passionfruit), bright citrus and then a little dank to balance it all out; secondarily, I was really interested in the new varieties that were on the table and wanted to work those in. Once the varieties were voted in I got to working on a blend. My first 2 blends were tossers, just a real hot mess of too much going on. Instead of the blend being bright and balanced the aromas were dull and muddled. Nothing really shone through, it just seemed like the varietals were competing against each other instead of being complementary. Just as I got to one I thought I liked, Sam noted that she got green pepper (and then that’s all I could smell). This is where Barb was really helpful. She and I worked to tweak that last blend by upping the Loral and Glacier and decreasing the Mosaic to get to our final blend. PB: Did you have a beer style in mind for this blend? NP: As far as a beer style goes, that wasn’t something I was really targeting. I was looking for a very versatile blend that would work well in a hoppy blonde, but still hold its own in a DDH style or even a dry hopped sour. 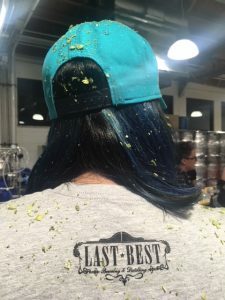 Natasha is the Head Brewer at Last Best Brewing & Distilling in Calgary, Canada. She previously worked at Tool Shed Brewing and Bomber Brewing. Prior to brewing she was the Brand Manager for National Beer Hall (as part of Concorde Group) in Alberta, managing the beer lists for four (4) restaurants (60-72 taps/location), beer education, events, brand and general PR. She also spent a year as the Alberta rep for Copper & Theory, representing brands including Upright, Ninkasi, Gigantic, and Breakside. The Pink Boots Society is proud to announce that Stacey O’Connor of Fish Brewing in Washington is the recipient of the 2017 YCH HOPS Hop and Brew School ® scholarship. Stacey’s start to brewing, buying a kit online and brewing what she describes as “one very awful batch of beer on my stovetop” could have stopped her in her tracks. 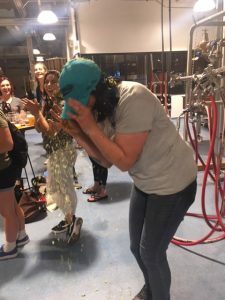 Instead she says that, “even though the beer was terrible I loved the process and I knew I could do better.” To improve she bought books to educate herself, joined a homebrew club and began brewing as often as she could. That determination to learn, improve and grow not only improved her homebrew but ultimately landed her a job in the professional brewing arena. YCH HOPS Hop and Brew School ® is a two-day onsite course in Yakima, WA that will cover topics including new trends in hop breeding, hop chemistry and brewing techniques. Guest speakers include award-winning brewers from across the United States speaking on hop usage, recipe formulation and brewing methods. Local hop farmers will also be in attendance to address the numerous growing aspects of hops from yields and aroma characteristics to new, up and coming proprietary varieties. The course also includes a ranch tour, where attendees will experience the hop fields and witness hop picking, drying and baling, as well as a guided tour of YCH headquarters, where they will observe the receiving and warehousing of the hops. In addition to attending the course, Stacey will receive a pair of pink steel-toe rubber boots when she fulfills the Pay It Forward requirement associated with the scholarship. 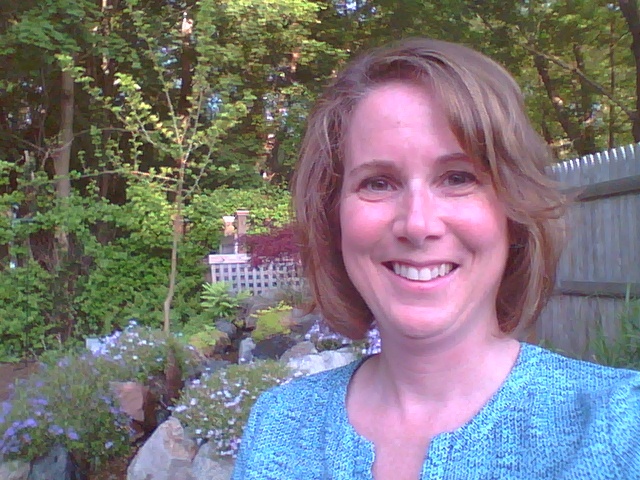 The Pink Boots Society is proud to announce that Andrea Ludlam of Massachusetts is the recipient of the YCH HOPS Hop and Brew School ® scholarship. Andrea, unlike many Pink Boots members, occupies a position within the beer industry that exists outside of a brewery. Her role as a beer, wine and liquor buyer for distributor Sheehan Family Companies, her first in the industry but one that draws on her background as a buyer in other industries, has given direction to her broad dream of starting her own business. That business? A hop farm which will support local breweries by growing exceptional quality hops. In addition to attending the course, Andrea will receive a pair of pink steel-toe rubber boots when she fulfills the Pay It Forward requirement associated with the scholarship. The Pink Boots Society is proud to announce that Brienne Allan is the recipient of the 2015 YCH Hop & Brew School scholarship. Brienne is a brewer for Jack’s Abby Brewing in Framingham, MA. 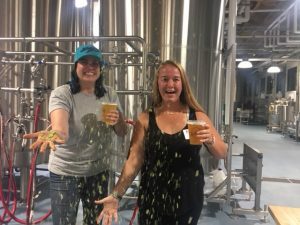 Chosen by the PBS Scholarship Selection Committee (SSC), five very experienced women beer professionals who hold positions as brewers, educators and writers, they felt Brienne should receive this scholarship due to the initiative she has taken to seek out education since starting at Jack’s Abby, something the brewery manager commended her on in his letter of recommendation. Brienne has been with Jack’s Abby since 2012 where she’s had the opportunity to gain experience with barrel-aging, sour beer production and an array of cellering responsibilities. She knows that being employed at a brewery that produces hop-forward lagers she’ll be able to put what she learns at the Hop & Brew School to good use. 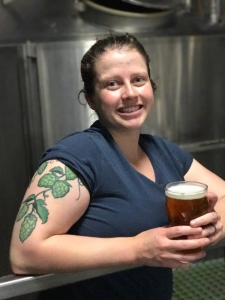 Prior to joining the brewing staff Brienne worked both in the tasting room and in the packaging department where she was responsible for all aspects of packaging from equipment maintenance to employee management. She has also been involved with the Master Brewers Association of America and attended Hopunion Hop Academy, the Brewers Guild Quality Control Seminar and multiple festivals to increase her knowledge base. YCH’s Hop & Brew School is a two day, on-site course in Yakima, WA, consisting of presentations by hop and brewing experts, including award-winning brewers from across the United States speaking on hop usage, recipe formulation and brewing methods. Local hop farmers will also be in attendance to address the numerous growing aspects of hops — from yields and aroma characteristics to new, up and coming proprietary varieties. 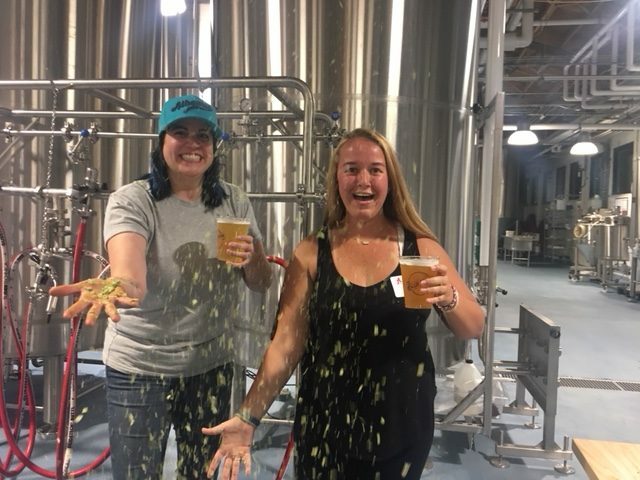 Also included is a ranch tour, where attendees will experience the hop fields and witness hop picking, drying and baling, as well as a guided tour of YCH headquarters, where they will observe the receiving and warehousing of the hops. In addition to attending the course, Brienne will receive a pair of pink steel-toe rubber boots when she fulfills the Pay It Forward requirement associated with the scholarship. © 2013 Pink Boots Society. All rights reserved. Pink Boots Society | Site produced by Sibyl Design, Inc.